Barred from discussing secret stuff related to my and Fahey's PAX planning I can nevertheless report that we'll be in the same location later this week as 1000 of the new Street Fighter IV sticks pictured here. Our PAX calendar runneth over. And even our pre-PAX calendar does as plans are taking shape for some mid-week Kotaku adventures in Seattle. Since we can't talk about that stuff and because I've lost track of the absurd number of MMOs Fahey has put on his agenda to check out (he's attending the Saturday Star Wars: The Old Republic demo, of course), let's just keep our PAX planning update to these SFIV sticks. 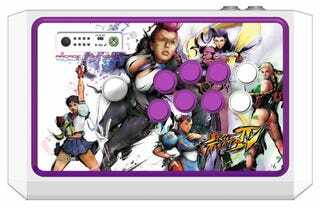 As of September 4, Mad Catz will be selling 650 Xbox 360 versions of the "Limited Edition ‘Femme Fatale' Street Fighter IV Arcade FightStick: Tournament Edition" stick; 350 of the the PlayStation 3 version. Two per customer. Available at PAX, or on the Capcom and Mad Catz online stores. U.S. consumers only. $159.99. I do believe that exceeds my and Fahey's per diem. Not that I'm a fighting game person anyway.